New Patch Abilities featured in Easy Quilts Magazine! 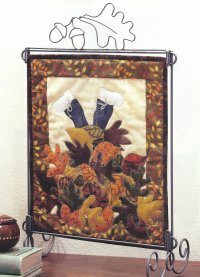 We are pleased to announce a featured pattern from Julie Bohringer of Patch Abilities in the latest issue of Fons and Porters Easy Quilts Magazine! You will find "Dive Into Fall" on page 50. Wondering where you can get your very own magazine and fabic kit? Well, from Merry's Stitchins, of course! We also have the table top stand and acorn leaf toppers available. Get your kit and magazine here! In other news...we have more new fabrics in the shop! Northern Cardinal from Holly Taylor is just in and we have the pre-cuts for Reindeer Games from Sandy Gervais. We'll let you know when the bolts come! We have lots of classes and events coming up through August, then in September is our big GARAGE/TENT sale. We are working on some BIG plans for October as well...so stay tuned!